The findings of a new study suggest there might be a link between compulsive electronic multitasking and obesity risk. It's possible that these devices are actually changing the brain, theorised lead author Richard Lopez, a postdoctoral fellow in psychology at Rice University in Houston. In terms of weight, that could mean less self-control when fattening foods are at hand. For their study, Lopez and his colleagues had 132 students, aged 18 to 23, answer questions about how much they multitasked and how distractible they were. Certain questions – such as, do you feel the urge to check your phone while you're talking to someone else? – were designed to detect compulsive or inappropriate cellphone use. When the food images were viewed, activity increased in the part of the brain linked to food temptation, the findings showed. These participants, who also tended to have more body fat, spent more time at campus cafeterias, the researchers said. Of course the study cannot prove that multitasking makes a person fat, only that there seems to be an association. But Lopez believes the findings suggest a link between multitasking and obesity risk – the connection being the part of the brain that responds to temptation. "We don't know what the effects all these behaviours are having on how we respond to other aspects of our environment," he said. At this point, "being mindful of multitasking is advisable," Lopez said. "Being mindlessly pulled in different directions by these different devices is probably not good for us cognitively, and it may have effects on other behaviours." "What this study can't tell us is what's cause and what's effect," said Dr David Katz, director of Yale University's Yale-Griffin Prevention Research Center. 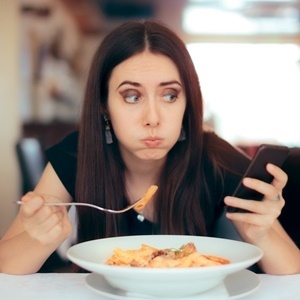 Do the same neurological predispositions favour media multitasking and overeating, Katz said, or does the activity alter the brain and foster obesity directly?